Divorce is never pretty, and it can become a true nightmare if you and your spouse have children together. No matter how you may feel about your spouse, it is important to do what is best for your children during the divorce proceedings, as well as after you and your spouse have divorced. But child custody can be a complicated matter, and it goes far beyond who gets the children for which months of the year. Here is a brief overview of the different types of child custody and their major differences, so you can decide what is best for your child or children. -Legal Custody – If you are granted legal custody of your child or children, this means that you are able to make legal decisions in matters that impact your child. This could refer to things like medical procedures, where your child attends school, and so on. -Physical Custody – This refers to where the child lives. If you have physical custody, your children will live with you. -Sole Custody – As mentioned, when a parent is granted sole custody, they typically have both physical and legal custody of the child throughout the year. While the other parent may have visitation rights, they have no custodial rights and have no say in decisions that affect the child. -Joint Physical Custody – This is when children split time between both parents’ homes throughout the year. The amount of time they spend in each home will be determined during divorce proceedings. -Joint Legal Custody – When parents are given joint legal custody, they both have input regarding decisions that impact their child or children. If there is a major dispute between the parents, and they are unable to come to an agreement, the matter may be settled by the court. -Bird’s Nest Custody – This is a bit of an unusual arrangement, but one which can make the divorce less stressful for the children. With this type of custody, the children live in one central residence, and the parents alternate who lives there. So, the mother may live in the home during the week while the father lives there on the weekends. However, as it can be costly for the parents to maintain three separate residences, this is not a common custody arrangement. Note that joint legal custody and joint physical custody don’t always go hand in hand. It’s not uncommon for one parent to be given legal custody, even if physical custody is shared. It is also possible for one parent to have sole physical custody of the child or children, but for legal custody to be shared. Generally speaking, the court prefers for parents to share legal custody, as it is generally better for the child or children to have both parents looking out for their wellbeing, instead of just one. -Unsupervised Visitation – This is the most common type of visitation granted, and allows non-custodial parents to enjoy time with their children without the other parent or a court representative present. The parent is usually permitted to take the child or children to their own residence or on a special outing. Visitations are always scheduled, and the schedule must be followed. -Supervised Visitation – If the parent is given supervised visitation rights, another responsible adult must be present during the parent’s visit. Sometimes, the parent is permitted to select the supervisor, such as a grandparent or family friend. In other cases, the court may appoint a social work or other court representative to be present during visits. -Virtual Visitation – This is not ideal as a sole form of parental visitation, but can allow children to feel connected to a parent who does not live nearby or who cannot visit frequently. This usually takes place using video-conferencing programs. During your divorce, it’s important to remember that your children are not to be used as leverage against your spouse. 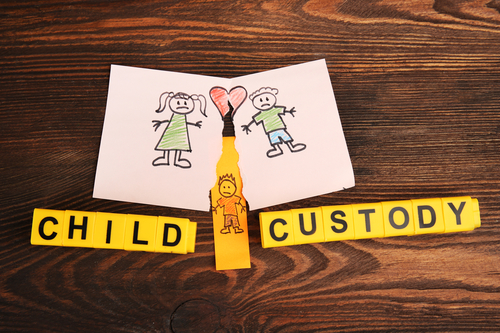 Child custody arrangements should always be made with the child’s or children’s best interests in mind. Please contact The Harr Law Firm for assistance in find the best child custody arrangement for your family following your divorce.